Often we hear of a crime being committed in view of a surveillance or security camera, or a suspect from a crime walking past a surveillance camera before or after the incident. The video and stills from these cameras are important pieces of evidence. PhotoModeler is a tool that performs measurements from images, and can be very helpful in obtaining accurate data from surveillance video. The Extract Measurements from Security Image tutorial might be of interest. A homicide suspect entered a bank shortly after the incident. A key piece of evidence was the suspect’s height. The video camera filming the lobby of the bank captured the suspect and his height needed to be verified from that footage. 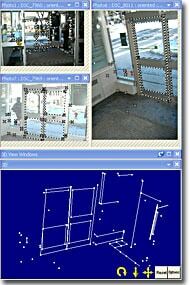 Still frames from the bank camera were combined with a 3D survey in PhotoModeler to calculate the suspect’s height. A verification was also carried out with the same camera, same technique and volunteers of known height. The technique was proven to be accurate and was used to aid in the criminal prosecution of the suspect. In this simulated scene a female, holding a child’s arm during an abduction, passes by a surveillance camera. 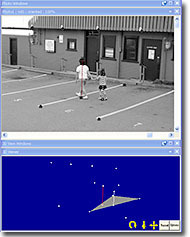 A survey was done of the parking lot to generate a set of 3D control points (this survey was done as a standard PhotoModeler project with a calibrated digital still camera). The data generated from the survey was used as control points in a single photo project based on the still shot from the surveillance camera. The height of the suspect and child (for verification) were measured using a single photo technique based on verticals from the plane of the parking lot.